Seven years ago, activist investor Carl Icahn spelled out a blueprint for breaking up media conglomerate Time Warner (TWX) into four separate entities. With this week's decision by CNNMoney's parent company to spin off Time Inc., Icahn's prediction is finally coming true. But he won't be able capitalize on it. By late 2008, Icahn had completely sold his stake. In 2006, Icahn pushed for Time Warner to essentially split itself into a content company, a publishing company, a cable services company and an Internet company. Time Warner's Time Inc. spin-off will mark the final step in turning the company into exactly what Icahn and a consortium of other activist investors wanted. 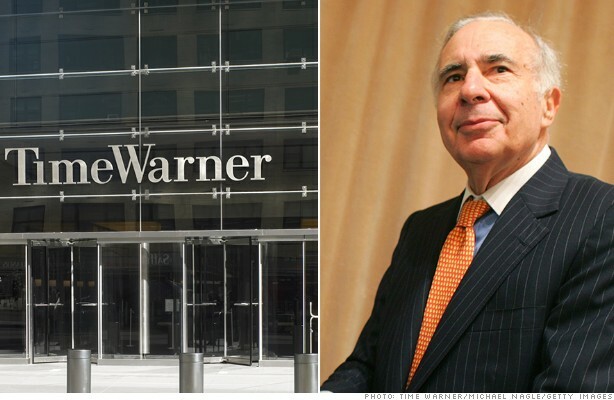 Back then, many questioned Icahn's case for breaking up Time Warner. Icahn's main foe at the time, former Time Warner CEO Richard Parsons, won that battle. Parsons refused to break up Time Warner, but he agreed to buy back more stock to get Icahn to stop pushing for a breakup (and a new CEO). Icahn wanted to bring in former Viacom (VIA) CEO Frank Biondi to replace Parsons, who eventually stepped down as CEO in late 2007. Under CEO Jeff Bewkes, who succeeded Parsons, Time Warner spun off Time Warner Cable (TWC) and AOL (AOL) in 2009. Shares of all three companies have solidly outperformed the broader market since those spin-offs. Related: Is Time Inc. better on its own? While the two central characters in the Icahn vs. Time Warner showdown have stepped away from the battlefield, analysts and investors cheered this week's spin-off announcement. Time Warner's stock has gained nearly 3% since the spin-off was announced late Wednesday and is up nearly 19% so far this year. Several analysts upgraded the stock and increased their price targets. "The announcement measurably improves Time Warner's growth profile, margin profile, and rids the mother company of a business which has been under secular siege for quite some time," B. Riley Caris analyst David Miller wrote in a research note. Back in 2006, Lazard, working on behalf of Icahn and other shareholders, estimated the content side of Time Warner could be worth as much as $61 billion, while the publishing unit could be worth $14.1 billion. Today, Credit Suisse analysts estimate that, post-spinoff, Time Warner's content divisions could be worth as much as $75 billion, while Time Inc. would be worth about $4.1 billion. Icahn did not return requests for comment. A Time Warner spokesperson declined to comment.